Our three year old, H, is obsessed with transportation vehicles. 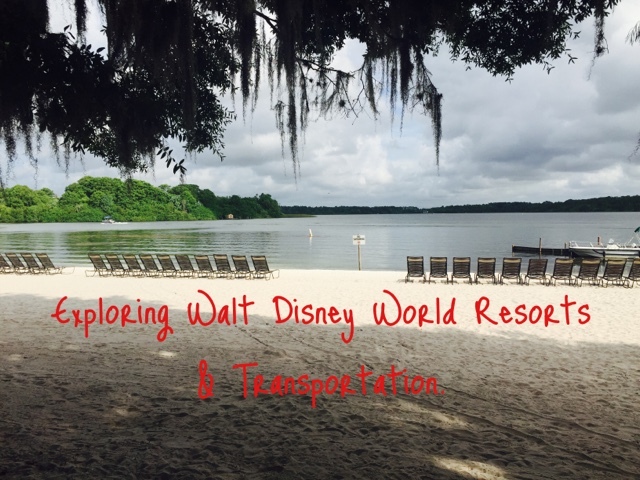 When we were planning our Walt Disney World trip we decided we would take our first full day and do nothing but things at the resorts outside of the park. 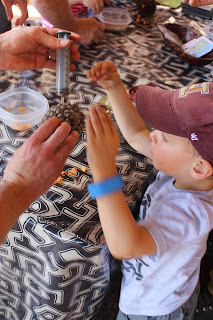 There are so many options and we knew H would have a blast. This would also give us time to exchange our military salute tickets into actual tickets at the Tickets and Transportation Center (TTC) without having to fight crowds. I would do this again we had such a great time and only touched a few of the resort areas - there are plenty more to explore. We met our friend Walter, who works at Disney doing all sorts of cool technology stuff, at the Fort Wilderness parking lot and hopped onto a bus that took us through the campsites and out to Trails End Restaurant. H loved riding the bus. We saw a trail ride getting underway as well as a horse drawn wagon. Trains End Restaurant served up an amazing breakfast buffet. The pulled pork eggs Benedict were amazing. There was yogurt in mason jars with all the toppings including a citrus quinoa which was delicious. Our three year old actually ate all the chocolate out of the chocolate chip Mickey waffles, but he was happy. Our one year old went crazy for all the muffins. When H got tired of eating he and I went outside to play on the playground that overlooks the beach so Jeff and Walter could get some time to visit. We followed the dirt trail through the ranch area and were able to visit with a few ponies that were out eating in the yard. The barn was open so we ventured in there as well. There is a small exhibit on a calliope wagon that still plays music. 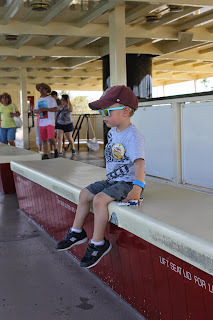 The kids were enthralled by all the horses. Just as we were about to leave Coronado Springs texted me with our room number so we were able to drive right over and open our door with our magic band. Genius! We got the bags unpacked and settled in to our room before we headed out again. We drove to Animal Kingdom Lodge in time for the animal enrichment program. H earned a bead for helping to make enrichment items for the animals. They also had flamingo feeding, cookie decorating and a whole host of other activities all listed in the activity guide. 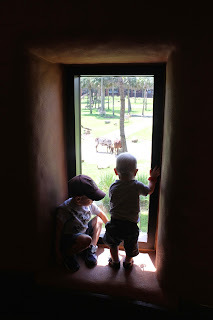 We got to see lots of animals up close and many of them from the air-conditioned lobby. The best viewing though is from the outdoor area on the first floor. The enrichment items are placed just outside this viewing area so the animals gather around. We spent about an hour exploring the lodge and the animals. Then we headed over to Disney Wilderness Lodge to park the car and begin our transportation adventure. 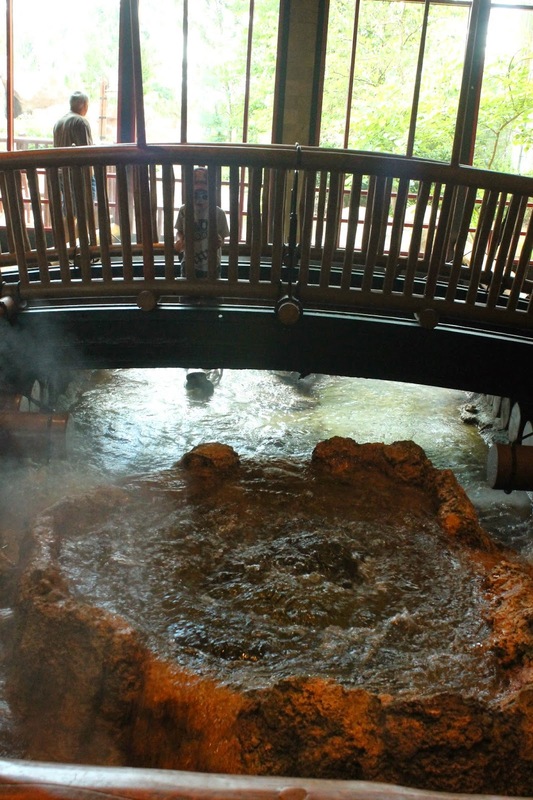 At Wilderness Lodge, H loved the small bridge over the bubbling geyser in the lobby. From there, we followed the river down to the falls and finally down to the actual geyser that erupts every few min on the lakeshore. 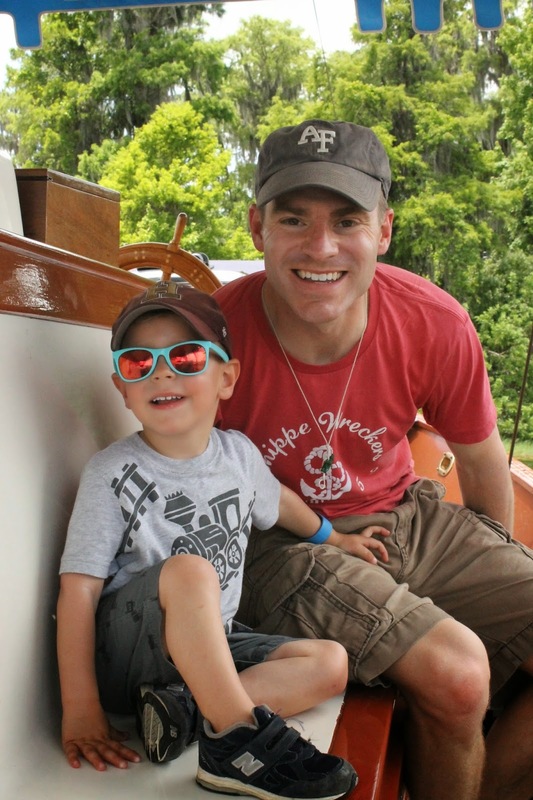 We loaded into a boat heading to the Fort Wilderness Campground and then on to the Contemporary. H got to be the captains "first mate" and blow the horn three times before we left the dock. On the boat ride you can see the remnants of Discovery Island, the old animal park, as well as the abandoned River Country Water Park. Our boat captain was happy to point things out on our way and answer all our questions. H was so charmed that upon disembarking he said "Thank you, Captain." Getting to blow the horn on the boat. At the Contemporary we met up with the monorail. 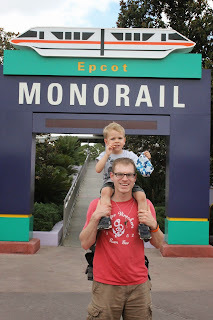 We rode one stop to the TTC where we hopped off to do our ticket exchange and transferred to the Epcot monorail. Riding to Epcot you actually make a circle all the way through future world. H loved seeing all the attractions. You can just stay on the monorail and continue back to the TTC. We found Mickey at the TTC! Back at the TTC we walked to the Polynesian where we grabbed a Dole Whip treat in the Pineapple Lanai. No sooner had we finished the Dole Whip then there was a woman walking around handing out chocolate chip cookies. We also plopped H in the corner where they were playing some disney sing along movie, so we could check e-mail and respond to a few pressing issues regarding our house. Once we had soaked up some AC it was back upstairs to get on the Monorail and over to the Grand Floridian. Enjoying A Dole Whip Together. As soon as we walked into the Grand Floridian, H exclaimed "this looks just like the inside of Elsa's Castle!" We walked around and soon found H watching the man playing the piano. We ventured outside to the beach, where H played in the sand for a bit before declaring that he was ready to see the castle. On our way back up to the monorail the piano had been replaced by the house band, so we stopped and had a quick dance. 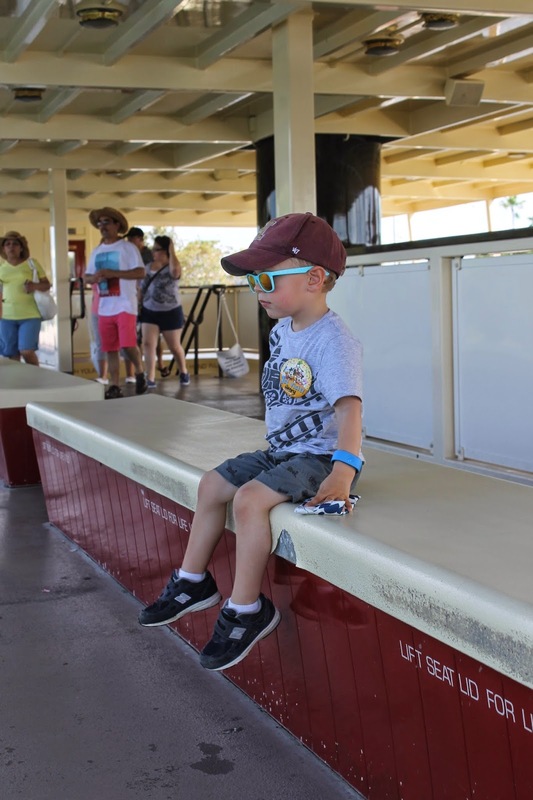 Back on the Monorail, we rode back through the Magic Kingdom, through the contemporary and to the TTC where we tranferred to the large ferry boat going back to the Magic Kingdom. Walt Disney was totally right, arriving by boat is amazing, watching the castle get larger and larger. Once at Magic Kingdom we walked down the boat launch to a resort boat headed back to the Wilderness Lodge. Best seat on the monorail is by the window. We walked back up to the lodge just in time to check in for dinner at the Whispering Canyon Cafe. 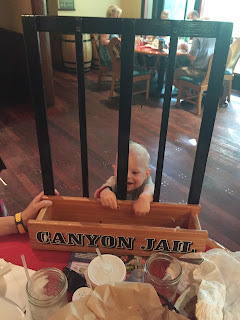 Jeff and I both ordered of the entree menu at Whispering Canyon and found our food to be delicious - he had the ribs and I had the red snapper. H ordered the grilled cheese and tomato soup. It came with a side of carrots and hummus and some green apples. Every last bite on every plate was gone. Although we missed the stick horse rides (they typically happen on the top of the hour) we were involved in plenty of antics. H loved having straws thrown at him. 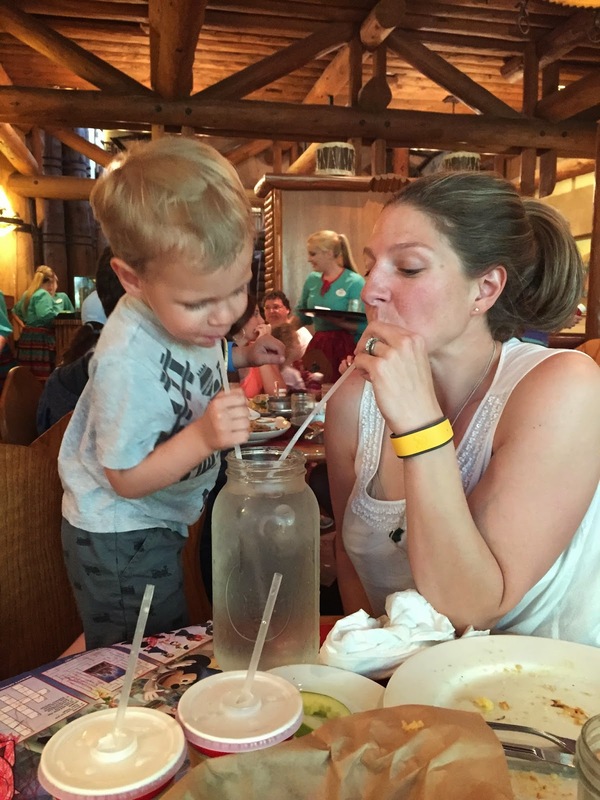 When we asked for more water a huge glass arrived and H found himself in jail for spitting water through a straw! Oliver also ended up in jail for throwing his corn muffin on the floor. The original plan was to take the boat back to Fort Wilderness for their evening campfire with Chip & Dale, but H really wanted to go to the pool. So we drove back to Coronado Springs and quickly got changed into our suits. H dawned a life vest and was even brave enough to go down the big water slide on his own! We grabbed some marshmallows and roasted them at the resorts campfire. I would say we had a successful day at Disney, without ever setting foot into one of the parks!